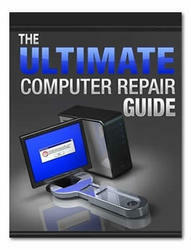 See "Removing the LCD Module" on page 74. Turn the computer over. 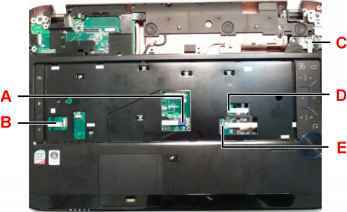 Remove the fifteen screws on the bottom panel. Disconnect the indicated FFCs (A, B, C, D, and E) from the Mainboard. NOTE: Avoid pulling on cables directly to prevent damage to the connectors. NOTE: Use the pull-tabs on FFC cables whenever available to prevent damage. 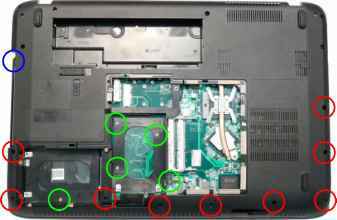 Open the locking latch on A and disconnect the FFC from the Mainboard. 5. Open the locking latch on B and disconnect the FFC from the Mainboard. 7. 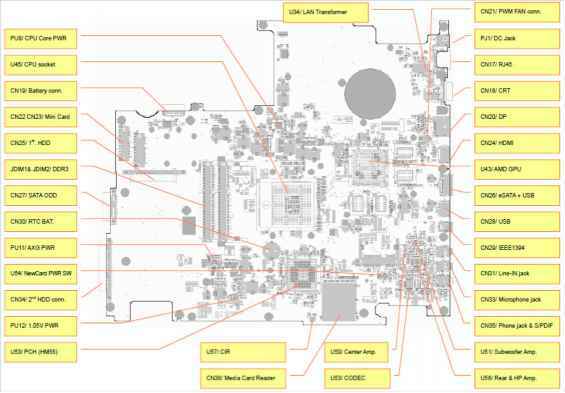 Open the locking latch on D and disconnect the FFC from the Mainboard. 8. Open the locking latch on E and disconnect the FFC from the Mainboard. 9. Remove the eleven screws securing the Upper Cover to the Lower Cover. Remove the Upper Cover as shown. Turn the Upper Cover over. 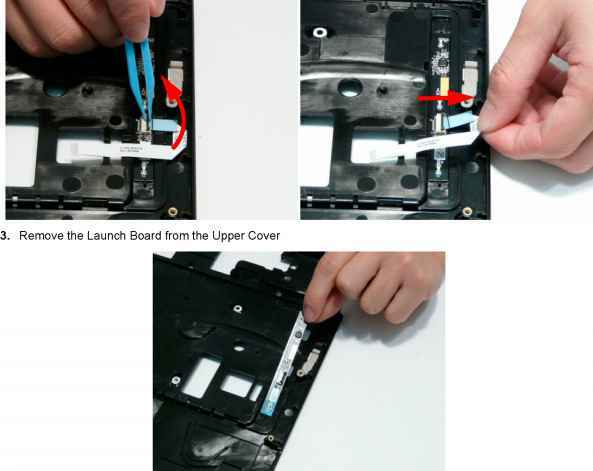 Open the locking latch on the FFC and disconnect it from the Launch Board. 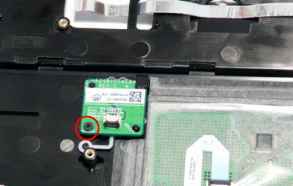 Open the locking latch on the FFC and disconnect it from the Media Board. 3. 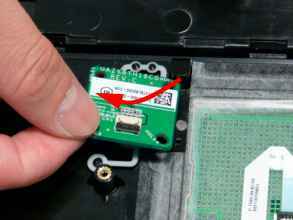 Open the locking latch on the FFC and disconnect it from the Volume Control Board. 4. 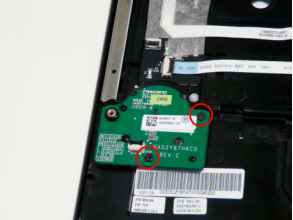 Remove the two (2) screws securing the board to the Upper Cover. 5. Lift the board clear of the Upper Cover. Lift the protective covering and FFC away from the Upper Cover to detach the adhesive. 3. Continue lifting the FFC away from the Upper Cover as shown. 4. Remove the FFC from the Upper Cover. 3. 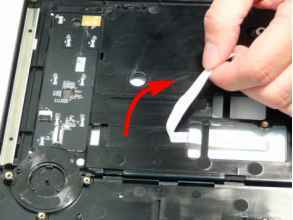 Remove the FFC from the Upper Cover by peeling back the adhesive as shown. 4. Carefully pry up the edge of the Media Board as shown. NOTE: The Media Board is secured in place with strong adhesive; ensure that the board is not deformed during removal. 5. Lift the Media Board clear of the Upper Cover. 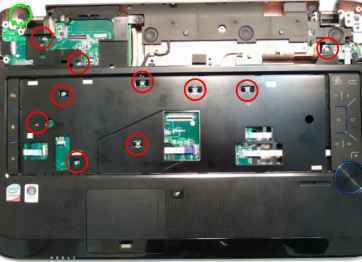 Open the locking latch on the FFC and disconnect it from the TouchPad Lock Board. 3. Lift the FFC away from the Upper Cover to detach the adhesive securing it in place. 4. 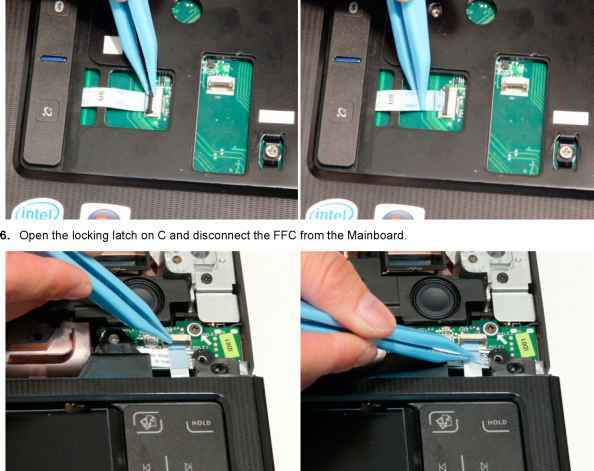 Open the locking latch on the FFC and disconnect it from the Finger Print Reader. 5. 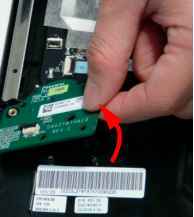 Remove the single screw securing the board to the Upper Cover. Lift and rotate the board in the direction of the arrow to remove it from the Upper Cover. 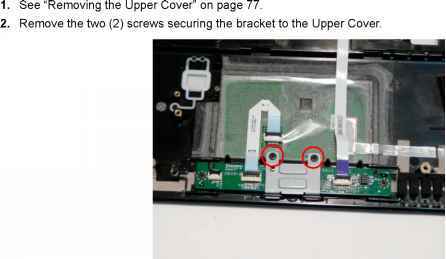 Rotate the bracket away from the Upper Cover and remove it as shown.